Why bother to make a noodle shop classic on a holiday? Because it may well be a noodle shop classic, but as there are no classic noodle shops here in Athens, Ohio, eccentrics like myself take up the challenge to make it at home. And really, it isn’t such a bother as all that. It just requires that you make a couple of elements of the recipe in advance: roast pork, and proper Chinese stock, in order to make the soup taste right. 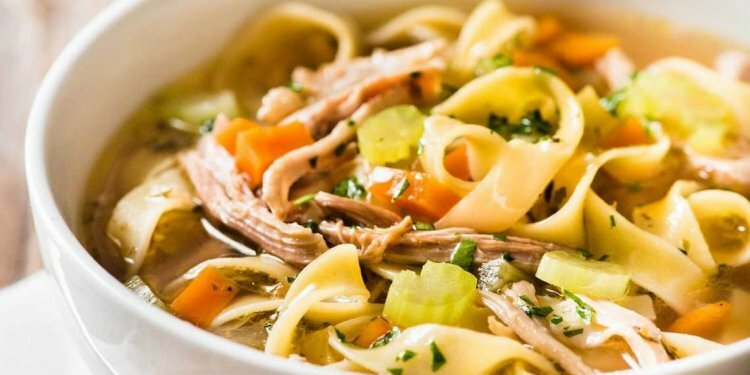 Really traditional Chinese chicken and pork stock is essential to making excellent Chinese noodle soups. With hot and sour soup, which has so many other flavoring elements, a plain chicken broth or stock can be used, but noodle soups rely less on seasonings and more on traditional meat stocks for flavor. I have found over the years that taking the time to just go ahead and make the proper Chinese stock makes more sense in the long run, than it does to start with a substandard packaged broth. Besides, it is easy to make lots of stock at once and then freeze the excess for use in soups and other recipes later. So long as you have freezer space, this is a good plan–and frankly, after tasting good homemade stock, lots of folks will -make- freezer space for it. For those of you who have read my post on making classic French style chicken stock entitled, “Making Stock: The Good, The Bad, and The Ugly, ” you have a good working knowledge of how to make basic stocks. If you haven’t read it, or have never made stocks before, please follow the link and read it; I explain very carefully the science behind making stocks, and all of the whytos and wherefores about working with bones and animal parts with which one may not be familiar. The Chinese method is very similar to the French method, but it is much more usual for there to be a mixture of meats and bones in the basic stocks of the Chinese kitchen. Usually the mixture includes parts of chicken and of pig; chicken and pork are the basic meats of most of China, so they are what is used on a daily basis in the kitchen. Chinese Muslims will exchange the pork for lamb or beef, while strictly vegetarian Buddhists will eschew meat stocks all together and will make vegetable, mushroom and seaweed based broths.